Nicola Barber is an Instructor of Biology and a Senior Research Associate with the Science Literacy Program. She is particularly interested in teaching and learning in the undergraduate sciences and how to effectively engage students with authentic science experiences in the classroom. Nicola is an advocate of active learning practices, teaching the scientific process alongside content and making science accessible to everyone. Prior to joining the faculty at the University of Oregon, Nicola pursued advanced training in both molecular biology and science education. Nicola’s undergraduate research was carried out at Colgate University and the National Cancer Institute where she uncovered a connection between nuclear pores and cell division machinery in budding yeast. She then completed her Ph.D. in Molecular Cell Biology at UC Berkeley where she applied genetic and cell biological approaches to demonstrate that conserved kinases orchestrate the timely progression of meiotic chromosome segregation in C. elegans. After graduate school, Nicola joined the University of Utah’s Genetic Science Learning Center where she focused on evolution and genetics curriculum development. 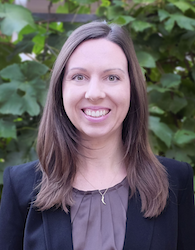 As a postdoctoral fellow she also contributed to the acclaimed Learn.Genetics website, led teacher professional development, and spearheaded a new outreach program that trained graduate students to develop and lead interactive science activities in K-12 classrooms. Nicola has taught a variety of cell biology and genetics courses to science majors, non-science majors, professional school students and in-service teachers. At UO Nicola continues to promote active learning and engaging students with the many elements of scientific practice through her courses on genetics, cell biology and developmental biology, as well as her science education research with the Science Literacy Program.